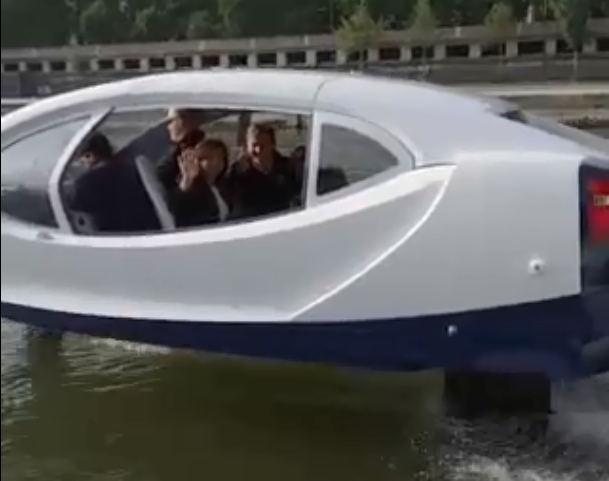 Paris mayor Anne Hidalgo took the river route to work on Friday, heading to the capital's Hotel de Ville by SeaBubble taxi. Ms Hidalgo has long supported bringing the electric-powered SeaBubbles water taxis to Paris. As reported this week, she persuaded local river authorities to allow further testing of the vehicles, which had fallen foul of regulatory red tape during an earlier phase of testing last year, in part due to speed limits on the Seine in Paris. Her river ride to the office, on one of the models brought to the capital for the three-day Salon Vivatech, which runs until Saturday, was a very public declaration of support for the vehicles, which produce no noise, create very small wakes and no carbon emissions - and can carry up to five people, including the pilot. The eco-friendly journey coincided with the first day of a 10-day public consultation on a climate plan for the city.